Cornell Cooperative Extension, the Poverty Reduction Coalition of Elmira, and the Natural Leaders Initiative are offering a new program in Elmira to improve the lives of its citizens. 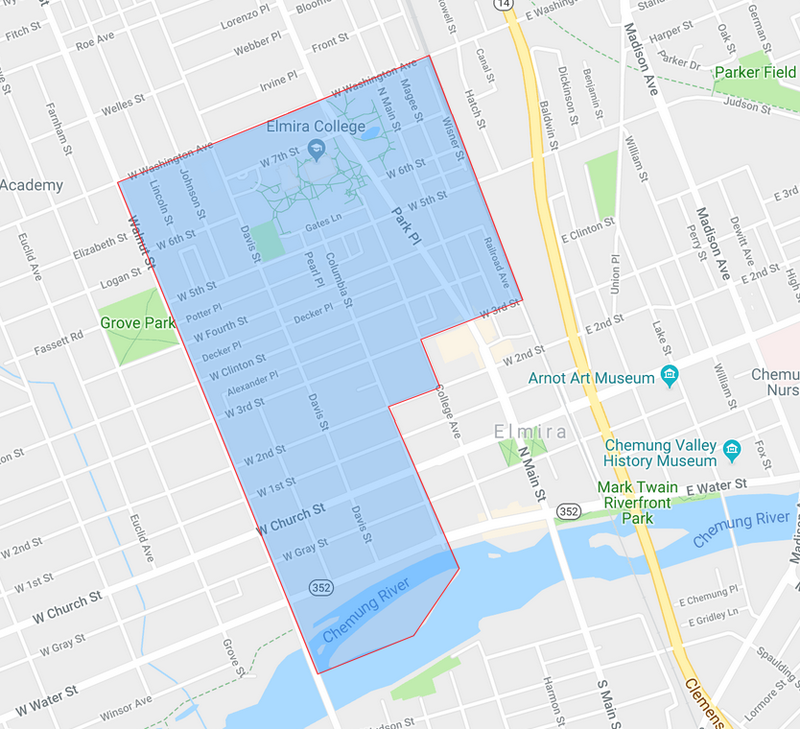 Now approved for the people in the City of Elmira’s census tract 6 (see map below), “Move Forward Elmira,” a Poverty Stoplight Initiative, is kicking off tonight from 5-7pm in the rear parking lot of Grace Episcopal Church (375 W. Church St). They are hosting this event for the residents of the census tract as a gathering place for neighbors to meet and greet. It is family friendly; offering free food, music, and a work clothing giveaway for men and women. What is the Poverty Reduction Coalition? “The Chemung County Poverty Reduction Coalition is part of a larger, state-wide project with other CCE organizations and Cornell University’s Tom Hirschl, professor of sociology. The objectives of the larger project are to engage local community leaders in shared learning about the activities and policies affecting poverty in their area. The project seeks to enrich the knowledge base on contextual poverty to create educational and awareness programs, and to then disseminate this information to policy makers throughout the state. What is Move Forward Elmira? This is a program initially being offered to people who reside in the City of Elmira’s Census Tract 6. “The Poverty Stoplight Methodology seeks to eliminate the multidimensional poverty that affects the families with whom we work. It allows families to trace their own poverty map and develop and implement a clear plan to overcome it. Through a visual survey which uses a series of photographs, families self-assess their level of poverty in 50 indicators grouped into 6 dimensions of poverty which are: Income & Employment, Health & Environment, Housing & Infrastructure, Education & Culture, Organization & Participation and Interiority & Motivational. Each indicator is defined as Red (extreme poverty), Yellow (poverty) or Green (not poverty). For applying the Poverty Stoplight survey, we use software developed in conjunction with Hewlett Packard. This entry was posted in Beneficial Bits n' Bytes, Uncategorized and tagged CCE, MoveForwardElmira, PovertyReduction, PovertyStoplight by Maggie Young. Bookmark the permalink. Next → Next post: New video streaming services, FREE with your library card!